Deferred action, DACA, DAPA: Obama immigration initiatives blocked. 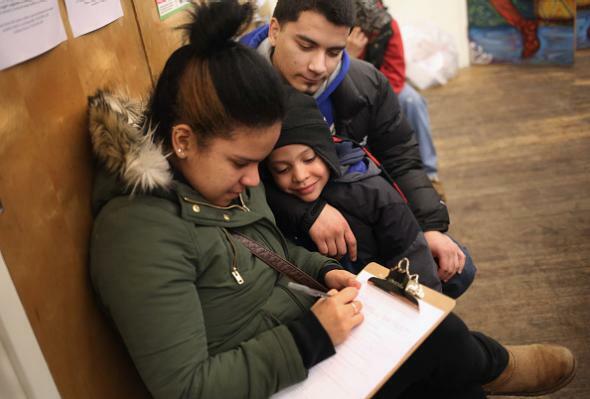 A family fills out an application for the Deferred Action for Childhood Arrivals (DACA) program, which has been blocked by an appeals court, on Feb. 18, 2015 in New York City. There are an estimated 11 million immigrants living in the country illegally. After House Republicans blocked a comprehensive immigration bill last year, Obama announced plans to use executive action to dramatically expand a 2012 program that deferred the deportations of hundreds of thousands of immigrants who entered the United States illegally as children. Under the new program, the undocumented parents of U.S. citizens would be eligible to remain and apply for three-year work permits, provided they had not committed other crimes and lived in the country at least five years. But 26 states, most with Republican governors, sued to block the program, arguing they would incur fees associated with the issuance of driver’s licenses to the immigrants and asserting the Obama administration had failed to abide by federal rulemaking requirements. The 5th Circuit covers Texas, Louisiana, and Mississippi and per the Times includes “a high number of judges appointed by Republican presidents.” The court’s ruling was a 2–1 decision in which two judges appointed by Ronald Reagan and George W. Bush outvoted a dissenting judge appointed by Jimmy Carter.